You have 24 hours to pack your bags before you flee. What do you take? Who do you say goodbye to? Hamza spent his last day in Syria with his parents. His worldly possessions were reduced to his phone, wallet and ID. By 7am the next day he was gone. “When I left all the other crossings were closed, there was only one that was safe for me to cross.” Hamza was smuggled through the region’s mountainous terrain until he finally reached the frontier where border police facilitated a safe crossing into Ramtha, Jordan. “Without exception, everyone leaving (Syria) left because they were hopeless and left with nothing,” Hamza says, as he recalls the early stages of the conflict. 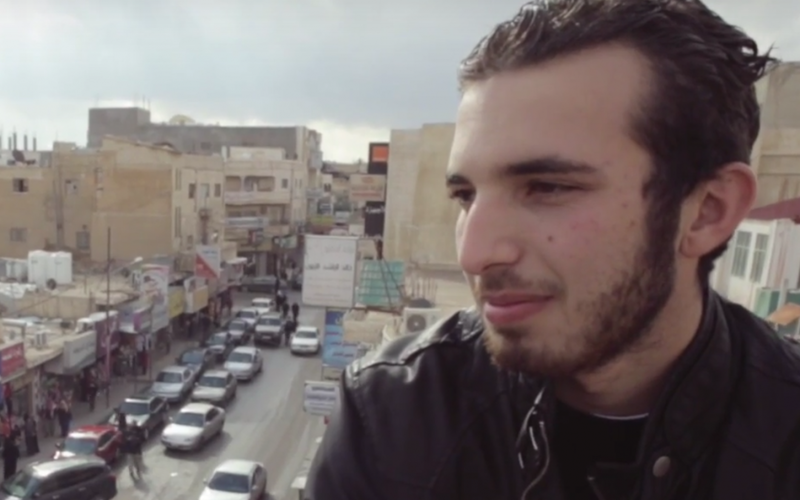 Like many, Hamza believed his stay in Jordan would be short and transient. “One month, two months, a maximum of three months, then I will go back,” he thought. How could anyone know then that the protracted conflict in Syria would result in 4.8 million refugees fleeing for Turkey, Lebanon and Jordan, or that 2016 would ring in the dismal five-year anniversary of a complex and raging civil war. In addition to the regional border crossings, over one million refugees have attempted the perilous journey from Turkey to Greece on flimsy death-trap boats. For many, the journey to Europe is taken in desperate hope for a life far removed from the violence and terror they have been subjected to. It is a final plea for a peaceful life. The mistake is believing that those who brave the daunting waters have a choice. When Hamza (21 years old) first arrived in Jordan in 2012, the densely populated Zaatari Camp, which now hosts close to 80,000 Syrian refugees, did not exist. Since then however, he has witnessed the exponential growth of the Syrian refugee population in overburdened Jordanian host communities, and the weight of unimaginable personal loss. “I have an older brother. When I left for Jordan, he was still in Syria with my family. After a while the situation got worse and he sent my parents to Jordan, but he stayed. A month after that the area he was in was fully under siege,” Hamza explains. During this time, Hamza’s brother was forced to survive on a meager diet of tree leaves and grass. With no one able to enter or leave the area where he lived, access to food and water was severely restricted. “It was a complete war zone,” Hamza states. Tragically, a year and a half later his brother was fatally shot by a sniper whilst trying to move to another area within the same region. Grieving the loss of his brother, Hamza could not bring himself to tell his parents. Later that day, friends of the family broke the devastating news; Hamza’s mother collapsed upon learning that her son had been killed. “For a while after I lost him, I couldn’t talk to anyone,” Hamza says quietly. Today Hamza and his family live in Mafraq, a Jordanian city in the north eastern part of the country that has continued to bear the brunt of the refugee burden. The city is close to the Syrian border and is located a mere 10 km from Zaatari Camp, the most populated refugee camp in the Middle East. The city is also one of the largest refugee host communities in the country. Hamza recalls great compassion among the local people when the Syrian crisis was in its early stages. But as the conflict escalated, triggering a mass exodus of civilians to neighbouring countries, Hamza sensed a gradual increase in hostilities towards refugees as the local community’s capacity to cope became greatly overstretched. “People started fleeing from all classes and backgrounds,” he explains. The impact of a war that is now considered to be the worst humanitarian disaster of our time, is evidenced in Jordan by the palpable societal tensions as host communities struggle under the pressure of depleting resources such as housing, education, and employment opportunities. The numbers speak for themselves: more than 655,000 Syrians have registered as refugees in Jordan (approximately 90% of the total number of Syrian refugees reside in urban areas). In some host communities more than half the population comprises Syrian refugees. The grim reality of these numbers demands support that necessitates greater social cohesion and resilience, ensuring communities are equipped to withstand and move through these testing times. Hamza recalls the initial segregation amongst the Syrian and Jordanian participants when the GFP – UNICEF Social Cohesion Programme first commenced. As each person introduced themselves, a natural tendency to be with one’s own was very obvious as recognisable groups formed. In light of this first hurdle, volunteers asked the participants to stand up and switch seats with their peers – they were then encouraged to get to know the person next to them. “The first barrier in the programme was broken through this activity,” Hamza explains. GFP volunteers employ carefully facilitated tools such as sport-based and arts-based peace-building activities to break down stereotypes, build friendships, and foster positive dialogue between Jordanian and Syrian refugee youth in host communities. However, a willingness to refocus the lens through which you view the world and those who inhabit it is crucial when seeking positive sustainable change. Social change processes such as nurturing trust and inclusion, do not emerge quickly – instead they require sensitive and patient approaches, with activities sustained over time. In the course of one such activity – Arts For Peace – participants were encouraged to draw images that reflect what they feel, or images that illustrate their hopes and aspirations. “Most of the Syrians’ drawings were about violence or war. They were expressing what they feel inside,” Hamza says. In an attempt to facilitate deeper understanding amongst the group, participants were asked to present each others drawings. “After this activity, things became easier,” he adds. Did you know that Generations For Peace and UNICEF recently scaled-up their Social Cohesion Programme from 10 to 16 host communities in Jordan? Read more here.